My brother and his fiance came to stay with me last week. They arrived just before lunch. I had had a super busy morning and we all had appointments in the afternoon. However, I still wanted to spoil them a bit with a yummy but quick lunch. This beef and pesto pasta was just the ticket. I had done the shopping the day before and lunch was whipped up in 10 minutes. If I were to make it again though, I think I would add some quartered broccoli florets while frying the meat, just to add a veg element and keep it a more balanced meal. This sauce could also be a great topping for a baked potato. Heat the oil in a wok or big heavy bottomed pan on high heat. Salt and pepper your beef strips and stir fry the meat and broccoli together until just cooked, but still a bit al dente. 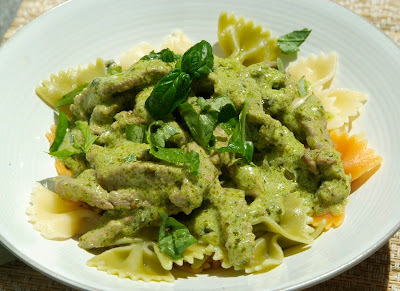 Remove from the heat, add the pesto and cream and stir to combine. Check the seasoning. Add the pasta and combine until well coated with sauce. Serve with a handful of parmesan.